Heavy-duty, extra strong and corrosion resistant. Features clean attractive appearance and are constructed for heavy duty applications. Includes rubber bumpers front and back corners. Frame is constructed with high strength extruded aluminum channel with a diamond pattern aluminum deck. 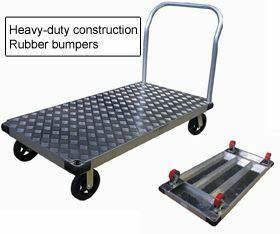 Removable handles can be placed on both or either end of the platform truck. Handle included. Rolls on 2 swivel, 2 rigid casters with roller bearing for long wearing use. FOB Shipping Point. Product No. Cap. (lbs.) Deck Size Wheel Type Wt. (lbs.) Price Ea.